Description Report on status of current activities of OPP that affect pesticide registration and label interpretation issues, and other “hot topics”. Discussion Zinn referred to an issues update handout, which is a current snapshot of popular issues, and a rule schedule summary. Zinn then introduced EPA’s Russell Jones, who gave a presentation on biostimulants. Following the presentation, there was quite a bit of discussion regarding biostimulants. There are some issues with folks spiking products. Jeff Comstock asked about nitrification inhibitors; he recently saw one with an EPA registration number, and wanted to understand that better. Jones says he’s not sure, but the biostimulators are being considered biopesticides. Even though the products have fertilizer aspects, the use rate is so low that they are not used as fertilizers. The claims make it seem as though they are to stimulate the growth of plants, to enhance growth and yield, resist pathogens, etc. So it looks like a plant regulator. Rabe added that these products are fairly extensive these days..some of the labels and claims are far reaching. Does the agency want notification of these types of products? The Association of American Feed Control Officials is discussing them as well. As associations what can we do to get a handle on this? It would be nice to understand the use and any regulatory needs now. Jones said the goal is to have guidance sooner than later. At the moment EPA is looking at products on a case by case basis, trying to find a clear path. There have been lots of internal discussion on this; questions from states are useful, please send them in, with all the info possible. Lopez commented that in Colorado there is lots of use on cannabis. Last year the department collected 25 different products and sent them to Fort Meade to understand what the components of the products are. Lopez asked if Jones’ office would like to analyze some of the samples? Jones replied that they would love to know what they components are and get an analysis from a reputable source, but can’t he can authorize the analysis. Lopez continued by saying that frequently the claims are verbal more than written in labels or labeling. But antecdotally they are widely known. Action Items EQI will develop a subcommittee to work with EPA on biostimulants. States should continue to submit biostimulant questions to Jones’ office. Discussion Rabe began by reiterating that some states will not register products with the DfE logo on the label. She asked if there is something else we can do that doesn’t involve the logo on the label? The change to Safer Choice created more push back. So, what can we do without this being one the label? Can we reference the website? While the reference would be in labeling, in FIFRA there is clarification that if a statement refers to a governmental site it is not misbranding. There would be a URL on the label for the website that then shows all of the approved products. It is another step and is not instant marketing, but consumers could go to the link to learn more. McClain responded that she is disappointed that an OPP/state discussion hasn’t occurred. She believes this logo protects consumers. At the point of purchase a consumer is not going to be reading every line on the label. McClain does believe consumers will read the label once they are home. David Difiore offered that the legal opinion EPA received regarding DfE does rely on consumers going to a website. Rabe would like to see a new legal opinion regarding Safer Choice now, since the previous legal opinion was for DfE, and it is about 8-10 years old. Bishop mentioned that there are scans and QR codes that could be utilized at the point of sale. Dwinell offered that a big disconnect is the idea that a product is safe. No pesticide should ever be considered inherently safe. It may be safe to use if the directions are followed properly. If the product is more environmentally friendly—that road can be gone down. But safe is not okay. It is an exposure risk as well, not just toxicity. And this is a very bad precedent to set. Dwinell suggests tying it back to an environmental outcome, which is fine, but don’t go anywhere near the word safe. McClain went on to clarify that the program believes that Safer Choice is not misleading, but DfE uses a separate website, although it is housed under the Safer Choice website. She is looking forward to more discussion on the option mentioned by Rabe. Lopez questioned McClain, identifying that EPA states that comparative safety claims are not allowed. If you are putting ‘safer’ on a label, that is comparative. 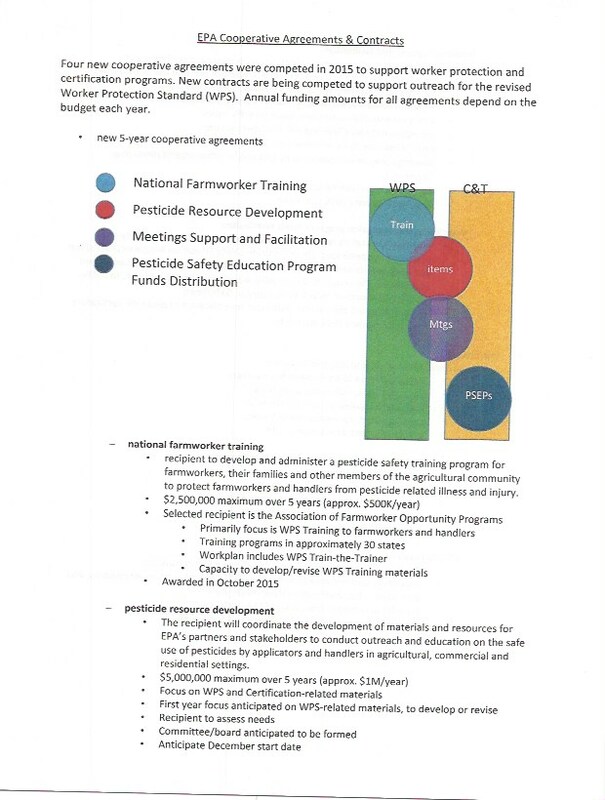 McClain emphasized that DfE is for pesticides. Rabe pointed out that it is linked online to Safer Choice. Difiore says they have talked to OECA, and the IG has committed to rigorously enforce label issues. He followed up by saying that the motive is to allow consumers to have efficacious products that are safer. Hopefully can find a way to get past the trigger words and find a way to find unity. Giguere thanked everyone for the discussion. Action Items Rabe and McClain will follow up with each other to discuss the URL proposal further. Discussion Rabe introduced the topic, saying the Joint Working Committees would like the full SFIREG to approve the measures to append to the guidance document. Rabe asked for changes or suggestions. She reminded everyone that it is meant to be a fluid product, and in the next year this would be reviewed again, especially after it is used during the first year. Lamanno suggested inclusion of a more definitive statement that the states do not have to adopt all the measures, and then on goal #4 he questioned the language about label modifications. Rabe agreed to take off the word label, so then it reads ‘state restrictions’. Jones asked if label could be taken off of B as well—label modifications. Renchie offered a couple of observations in general, they have gone so far as to be ready to adopt the MP3 in Texas, and they have included discussions involving stakeholders, advisory groups, etc., with about 30 types of stakeholders. They will utilized the crop register and the apiary registry. To participate you have to be a licensed applicator. They have found the MP3 to be a useful tool, and the fact that it didn’t have to be approved with EPA made it more acceptable to their communities. It will be very useful. Lopez agrees with Lamanno, to let everyone know that these are suggested measures. Looking at reducing exposures of bees to pesticides. One comment relating to bee kill documentation is that the kills typically don’t involve pesticide exposures, and that has been backed up via analysis. So, to clarify in the measure—document bee kills—that doesn’t take into account that pesticides are related. so include both—bee kill, then abiotic/biotic, then pesticide? Rabe recognizes that the word pesticide should be included in the subcategory. Even if it is explicit elsewhere it will be clarified in the measure/sub measure. Rabe added that some folks want to document all bee kills because that allows a comparison to pesticide related bee kills. Cook added that including footnotes could be useful as well. Giguere noted that some plans include many issues aside from pesticides, so some states would like to keep that in there. That is more of a holistic plan perspective, and is reflected in the measures. Lopez reiterated that they have a lot of hobbyists and they always blame pesticides. And it is a very political issue. Jones said he appreciates the flexibility of the plans and measures and asked if the SLA responsible for the measures? Rabe responded that this is something that the states can take and use as they’d like. This facilitates EPA’s needs, and the measures allow us to evaluate the MP3s. Jones said that in NC they approached this as a rule making procedure. Lots of public comment. It will be difficult to capture some of the measures at the state level with all the different groups. He agrees with Lopez that there are a lot of uneducated beekeepers and lots of folks who don’t know how to properly raise and manage the hives. Rabe responded that is supposed to be a part of your plan, and it does take time. #4a-b, stress pesticide kills, stress voluntary…Reed motioned, Lopez seconded. No opposition, motion carries. Rabe will bring anything back to the committee after making the changes. Action Items Rabe noted the changes and they are captured here in the MP3 document. identification of any further action needed by POM. Discussion Rabe reviewed the September 2015 Joint Working Committee meeting, particularly the POM breakout sessions. Discussion Cook reviewed the September 2015 Joint Working Committee meeting, particularly the EQI breakout sessions. Cook introduced EQI’s benchmarks paper. Cook would like a PREP session &/or webinar education outreach for states on how benchmarks were developed, how are new ones developed, how are states notified, how states are using benchmarks/criteria/standards, get everyone educated and using them consistently. Comstock offered that one of the things missing in the paper is that the letter doesn’t stress enough that benchmarks are not regulatory standards, and that they were asked for initially because they are needed as reference points in the absence of mrls/etc..and using them otherwise is a strategic mistake. That needs to be reinforced. Suggest strengthening that reminder. Benchmarks are not appropriate for use as regulatory standards. if you are affiliating these with your management strategy and with your points database, that isn’t appropriate. Reestablish a point person in EFED for states to communicate with when results are near benchmarks. Bogner asked if the benchmarks are related to laboratory capacity? No, the benchmarks are developed using known data and are intended to speak to environmental health. They are not related to regulatory standards or to what labs are capable of testing for/to. We need to reestablish why the benchmarks exist. Moses supports the solutions that are suggested. Giguere asked if the committee supports EQI working with the PREP water course committee to establish a benchmarks module. Black suggests 2017. Comstock requests EQI, SFIREG, and EFED to work together to create a training webinar and materials regarding benchmarks to incorporate into a PREP training module. Reed seconds. Seeing no opposition, motion carries. Separately, Cook included a discussion paper on POINTS developed by EQI. EQI will submit the paper to EPA for further discussion if necessary. Action Items Cook will work with EQI, SFIREG, EFED and PREP to develop a training session for states related to appropriate use of benchmarks. Description Is there a desire for SFIREG to standardize the information for reporting bee kills to EPA? What role does NPIC play? Discussion Steeger clarified that NPIC is not for state’s reporting. Discussion revolved around the idea of standardized reporting, and what EPA wants from the states. Region 4 supports standardized reporting and asked Steeger to comment. Steeger responded that EPA is identifying data elements right now. Jackie Mosby, EPA/OPP/FEAD, is chairing a PPDC workgroup and attempting to utilize that to identify data elements for ‘incidents’. Eventually EPA would like to have a website. Description How are States dealing with the issue of licensing? Discussion Unmanned Aerial Vehicles (UAV) is the preferred term for drones. Discussion centered on how to license applicators using drones for pesticide application. The applicators are not considered aerial applicators, despite the application method. A new category for drone applicators may be required for appropriate managment and certification needs. Description Should SFIREG or AAPCO facilitate a process for States to pool resources to help make risk assessment decisions with regard to pesticide use on medicinal, recreational, and industrial cannabis? Discussion At this time states who have medical marijuana or recreational marijuana are having to work with the plant not as a Schedule 1 drug, but as a significant agricultural crop. Risk assessments for pesticide use on the crop are essential. Pursuit of a 24(c) product is on the horizon, but the states want the effort to be successful. NV has been developing two 24(c) applications. Lopez requested that states slow down. He stressed that the states can work togehter to coordinate the applications. Zinn is the EPA point of contact for pesticide use on cannabis. EPA is formaing a workgroup to identify and scope out issues. They are looking to have a conference call with agency Directors, SFIREG and TPPC. Jeff Case of CropLife Americal expressed concerns from registrants, and suggested that they be included in a workgrop as well. They also want hemp to be included in the conversation. Colorado has submitted a draft 24(c) template to EPA and is waiting response from the agency. Risk cup considerations are a significant issue. If the risk cup is already close to full, the product will not be pursued. Colorado agricultural statistics for the 2015 season show $800 M for alfalfa, $700 M for cannabis, and $600 M for corn. That shows the effects of legal (esp. recreational) cannabis production on the ag markets in the first year. Industrial hemp is another crop coming on strong, and there are some University programs now working on it. Discussion The final results of the C&T survey developed by AAPCO-SFIREG-ASPCRO were presented. Creger said the major concern for states is in many cases a financial one. It does not appear that EPA engaged the states or regions in rule preparation. The comment period is much too short for the volume of material and issues. The economic assessment is very important to use, and thank you to Texas A&M. Each state needs to do their own assessment-even similiar and neighboring states can be very different in terms of economic impact from the rule. At this point it appears that the costs exceed any perceived benefit. Moses offered two recommendations: let the states reset the certification cycle, and allow the states to determine the number of continuing education credits required by category. This represents the single largest change to the program in 25 years. Keaney said he is sorry that CTAG has not been paying attention. Every biennial meeting this rule development has been discussed. It is difficult to see why the components of the rule are a surprise. Keaney emphasized that this is a proposal and that there are alternatives to many of the rule components, and that they are looking forward to the suggestions in the comments. Giguere brought up that times have changed since EPA began working on this and areas that may not have come up earlier–such as hard copy data managment in certification programs–have now expanded to such a degree that database structure changes required by the rule are enormously expensive. Reed stated that the states appreciate EPA’s willingness to work together on the rule, and emphasized that the states need more time for commenting. Moses asked about CTAG’s recent involvement in the rule and if there was consensus that we need to do this because the state’s applicators are not cempetent? Keaney replied that various themes arose through time. Some states moved foreard with those needs and some states are still where they were when the rule was first promulgated in the 1970s. Giguere asked if comments submitted outside of the docket would be considered and Keaney responded no. Keaney suggested using AAPCO’s comments as a starting point, include equivalency considerations, and submit comments even if they are still in draft form. Keaney then thanked Dr. Renchie for getting the Texas economic analysis off the ground and into the state’s hands. Renchie emphasized that everyone is working together to find the facts. Creger asked about engagement with the regions. Keaney responded that they had been involved as much as, or more than, the states. Creger also asked if there had been discussion of the state’s giving the program back to EPA? Keaney said yes. Giguere noted that there are some trends related to the rule that are of additional interest to the states, such as 3rd party certification. Reed added that soil fumigation is a good example-are the states to submit exams to the Registration Division for approval, per the training requirements that are on the labels? This is a concerning area and the states do not want to see it expand into more. Who in the agency is qualified to review certification exams? It is not appropriate for RD to be involved in C&T. KEVIN KEANEY, OPP/EPA Discussion on the awarded WPS grants; with emphasis on how SFIREG should expect to interact with these grantees. Description Discuss formation of and roles and expectations of the Worker Protection Advisory Group and how SFIREG should expect to interact. Discussion Keaney included a handout related to the grants in his discussion. At this time only one of three grants has been formally announced, therefore he couldn’t speak more on the topic. Giguere asked if EPA was considered formation of a CTAG-like advisory group for WPS. Keaney said yes. They would like a formal liaison to CTAG and WPSAG. Giguere emphasized that SFIREG was the appropriate avenue for EPA to work with the states on implementation issues. Discussion Please see Fleeson’s presentation. Discussion Moses described AAPCO’s extensive work with the C&T rule, and commended Tim Creger, NE for his diligence in chairing the AAPCO workgroup. He also discussed board changes, with Steve Dwinell, FL, leaving the board as he has taken a new position in FDACS. Rose Kachadoorian, OR, has been appointed to assume Dwinell’s position on the board. Pat Jones, NC has agreed to replace Dwinell as chair of the WPS workgroup. The applicator exclusion zone, which was not part of the WPS proposed rule but was included in the final rule, has become an issue the states and EPA will have to sort out moving forward. The Annual Spring Meeting for AAPCO will be held March 6-9, 2015 in Alexandria, Va and the board is close to finalizing the agenda. That effort has been led by AAPCO President-Elect Dennis Howard, MD. Moses also drew attention to the new AAPCO website, which went live in September 2015. Discussion Please see Renchie’s presentation. Renchie also showed the committee the online economic analysis tool for states to use when developing comments on the proposed C&T rule. The tool may be accessed through the AAPSE website. Description Report on OECA activities that affect SLA enforcement programs. Goal is provision of information and identificaiton of any further action needed by SFIREG. The WPS course, which is co-located with PREP’s compliance and enforcement course, will be located in Asheville, NC from May 2-5. The Pollinator Protection course will be located in either Orlando or Kissimmee, Florida in September 19-23. The PIRT website will be updated with the agendas and allow a place for people to register for the courses once those are ready. A few weeks ago, a PIRT Charter was circulated around the FIFRA community for comment. The PIRT Charter provides guidelines and expectations for the PIRT Steering Committee and for PIRT hosts. We have incorporated those comments, and we are adding some final touches on the document. It will then be posted to the PIRT website. A few weeks ago, I sent out a survey requesting input on what topics people would like to see for the FY2017 PIRTs. The survey provides a list of topics that the Steering Committee came up with, as well as a suggestion box for any other ideas. Once you complete the survey, you can see the results. So far, it looks like there may be another WPS course. Several other topics are neck to neck with each other, so it’s too soon to tell what the second topic may be. The survey will close on January 4. So if you haven’t completed the survey yet, please do so. Also, it is perfectly acceptable for more than one person at a state to submit a survey response. In early January after the FY2017 topics have been selected, I will send out a request for hosts for those topics. We will select the FY2017 PIRT hosts in February. On Friday, there was a public announcement that the WPS dashboard is available to EPA social media and ECHO updates listserv. Based on feedback we received, we’ve made some changes to the dashboard since the concept was first introduced to states. Since the webinars that were hosted a few weeks ago, some minor phrasing and graphic features have changed. You are welcome to visit the site and provide comments on the features by clicking the link at the top of the ECHO WPS dashboard screen . Data is coming from 5700 forms, ICIS for EPA actions, and the ICR from the WPS Rule. The new performance measures are final and EPA Regions should have had conversations with the states about them. EPA Regions and states should work together to determine how they will implement the new performance measures. There is a tab for performance measures on the FIFRA cooperative agreement work plan and report template. The template is posted online. In October, OPP and OECA made some amendments to the cooperative agreement guidance. 5700 forms and end of year reports can be submitted together on the same dates annually to the joint mailbox FIFRA-EOYRepots@epa.gov on or before February 28th of each year. The FIFRA CMS is being added to Appendix 4 of the guidance and will not be removing the Enforcement Priority Setting Guidance that is currently there. OECA and OPP will soon be kicking off the drafting of the next cooperative agreement guidance for FY2018-2020. OECA, with OPP and Region 5 have begun revising and updating the WPS Inspection Manual to reflect the changes to the regulations. We are also hoping to make other improvements to the manual to make it more useful. The states and tribes will have a chance to review the draft document in early spring, but the earlier we hear about issues, the easier it is to address them. If States or tribes have any concerns based on the existing WPS inspection manual, or any suggestions for the new manual, we’d appreciate hearing them. You can send your ideas to Carol Galloway or Richard Pont, and we’ll also be talking about the guidance later this morning. These are the procedures field personnel implement when visiting operations that have livestock or poultry, to minimize any chance of carrying disease from one facility to another. To the extent that pesticide inspectors or other staff visit facilities with livestock and poultry, they should be following biosecurity protocols. Our revised procedures will be available in the next month or two online. If anyone has questions, they can contact Carol Galloway. Discussion Comstock summarized the effort to determine appropriate inspection time allocations. Bogner displayed data on laboratory time requirements, which had not been fully addressed in previous discussions. Description Discussion about supervisor certification for proof of training requirement vs. producing a certificate. Some states are still having difficulty accessing NETI and the dashboard. Discussion Chad Carbone from OECA presented a powerpoint on Federal Credential training requirements. Through January 1, 2016 a manager can certify the inspector has taken the training and that is sufficient for credentially the inspector. Mary Begin, DC, expressed issues she has had in trying to do just that. She detailed issues and confusion in working with the region, apparent confusion between the region and headquarters, and difficulty in obtaining the credentials for her staff. Moses chimed in that he had similar issues as well. Messina stressed that he wants to understand and clear up issues and advised Begin, and any enforcement managers, to contact him directly at 202-564-1191 if issues arise. Messina emphasized that this is a business record and should be easy to document. There are three requirements: the FIFRA basic inspector course, the health and safety course, and be familiar with the DOT requirements. The DOT section was discussed and Messina stressed that the phrase ‘Be familiar with’ did not mean memorize the entire regulation. Know where to find the information needed, and have a general understanding of the intent and content of the regulation. ELMS and Wiki connectivity issues continue for some states. Messina mentioned old browsers, state security issues, password retrieval, and wiki connectivity as the major reasons folks can’t get into the site. NETI handles the connectivity to ELMS, and if folks continue to have trouble with access, please let Messina know so that he can advocate for solutions. Health and safety training was discussed. A 24 hr course online or in person is sufficient. New on ELMS, the training has been broken into modules. The refresher courses require 8/34 modules, so inspectors can take the ones most pertinent to their work. PIRT, PREP, label trainings, etc. all count towards refresher courses. Jones asked about regional trainings and if they would count towards the refresher, as he had heard that EPA headquarters had rejected that. There does appear to be a strong need for congruency between the regions and headquarters. There are lots of miscommunications occuring. Messina intends to address the regions and continue to improve understanding across the board. El Abdaoui asked how to work with states who are not comfortable certifying. She agreed that there is misunderstandings and miscommunication and pointed out areas where there is currently conflicting information on the requirements. She emphasized that the regions need better training from headquarters to support consistency. Action Items Messina will issue a clarifying memo to the regions and states. Description Dow was working with states to validate a method for detecting aminopyralid, clopyralid and picloram in composts. SFIREG is interested in method progress. Discussion Bogner presented a powerpoint on the method. She also noted that Michael Hastings of Dow intends to present on the method at the AAPCO lab directors meeting in March. Description States are being encouraged to look for contaminants in formulation samples. This essentially makes all formulation samples into residue samples. The amount of effort involved in this change is significant and worth discussing. Discussion Bogner presented from a powerpoint. She recognized language in the National Program Managers guidance that supported having states begin taking more formulation samples and greatly expanded the analysis of these samples. The language used to describe the effort would have created a nearly impossible situation for most labs in the country. Lott responded that EPA had wanted to recognize that contamination has occured in formulated products, but, EPA did not consider the extent of the request in the guidance. EPA does not want the state labs to purchase new equipment and spend the significant amount of time required to address the concern. Lott will address the issue with the regions to clarify expectations, and thanked Bogner for bringing the discrepancy to the table. Discussion EPA’s approach includes in-person training opportunities, an updated inspection manual, and e-learning opportunities. Liz Vizard said that EPA is looking at Tier 1 & 2 definitions right now, and would like to have more conversations with the states on that, ie the importance of timing on the inspections, and how to collect and document information. Discussion Corey began by noting a couple of significant changes. TPPC’s former cooperative agreement with EPA expired and UC Davis is the new administrator providing support for the next 5 years. At EPA there have been program manager changes, and Cindy Wire is now the primary support for TPPC, working at R9. She has less time to devote, but works at a higher level. Lauri Figeria is also assisting at HQ. She has a background in school IPM, which the tribes are hoping to take advantage of. The next annual meeting is in Maricopa, Arizona in January. It is a bit of a fresh start, elections for leadership, looking at priorities and areas of focus, likely to include: funding for coop agreements—funding has reached a critical level for tribes in the absence of registration fees or taxes. New mandates and projects, such as pollinator protection, require a lot of these programs. It takes a lot of resources to establish a tribal pesticide program, lots of training, a lot of work goes into getting a person or program off the ground, and maintaining it can be very difficult. If those folks leave the program, the tribes have to start over. They need the resources and support to keep things going. There is competition for the staff. This coming year TPPC needs to elevate the funding dialogue and are wondering if there are opportunities to partner with the states, and to elevate the issue at EPA. It has reached a critical stage for many of the tribes. Another area of focus is related to one of the fundamental goals of TPPC, which is to be a resource for smaller tribes. They are currently trying to do needs assessments, and to help them. One area is the development of the MP3 program. Some tribes are taking the lead, and those tribes with the expertise are able to help the other tribes. TPPC is really interested in encouraging collaboration with the states. There have been some examples, such as in Montana with the Confederated Salish and Kootenai Tribes, and there are other states where that dialogue hasn’t occurred, so TPPC is asking the states to do what they can to foster the collaboration. Bees do not respect boundaries and we need to communicate between jurisdictions. Those are major issues, but another one to follow up on from yesterday….bed bugs in Indian Country continue to be a difficult challenge, particularly due to cultural practices and resource/financial limitations. The EPA is somewhat perplexed by the disconnect in Indian Country with web access, validity of advice, and there are discussions with other federal agencies such as housing and indian health alliance. David Flakne, Syngenta, mentioned that he serves on the board of Driftwatch/Fieldwatch and wanted to encourage folks to look at that for pollinator protection. There have been some major upgrades, including bee check which is very user friendly for apiarists. Apiarists can choose to be anonymous except for registered applicators. Moses mentioned that the SLAs can sometimes get discretionary money to work with tribes for training, water monitoring, etc and felt that the process was fairly easy to get the money. Moses encourages the tribes to contact the SLA, to see if they can work together, as it is a good option. Discussion Black offered a PREP summary report to the committee, and a presentation of the current program. Description This was an add-on session. At the WPS Prep course the week before SFIREG, AEZ requirements that had been added into the rule after the comment period came to light and require further conversation. Discussion There was a recap of the conversation from the recent WPS PREP course, and distribution of the letter North Carolina sent to EPA regarding the AEZ. There are issues with definitions…esp. if the farmer is the handler. The biggest issue is that states weren’t allowed to comment on changes that were put in after the comment period into the final rule. Reed stated that as a regulator it will be difficult to fine someone who is doing everything just right, and just because his field is 8 feet from the road he now can’t apply. Looking at some of the justifications, there are 17 exposures, and if AEZ had existed 12 may have been prevented—as onerous as this is, those don’t look like good rationales or justifications. So, the question is if the states chooses not to enforce, where does that leave us? Jones added that there isn’t much in there related to science, toxicity of products used, other measures to prevent exposure. How do you ask people to leave their homes in the middle of the night? Lots of contracts require maintaining field borders to prevent pest harborage, so there is no way to do both. Black offered a Pacific Northwest perspective. She is concerned about protestor issues, with folks planting themselves at field edges, …… and this is a worker protection rule, not a protester rule. Giguere addressed Keaney and Fitz, asking where do we go from here? Is enforcement discretion an option? Fitz responded that EPA heard loud and clear that folks are concerned. The change occurred to ‘moving bubble’ because it is where the application occurs, vs a total field protection. Fitz is looking at interpretations or possible ways to alleviate the concerns. Giguere asked POM to please take this on…poll the working committee for quick turn around for questions and guidance. Rabe agreed. Moses followed up noting that in NC’s letter it says that the AEZ could not be commented on. He would like clarification on how that could be done without allowing comments. Fitz responded that it was a field level exclusion zone, so after comments on that, this was a much smaller exclusion zone. Jones added that in the proposed text it said that the area won’t extend outside of the ag establishment. That is the biggest change that wasn’t included in the original. A farmer cannot control outside of their property. Fitz replied that there are 2 requirements, 1 keep folks out of the aez within the ag establishment. Thats ok. But the second is that the applicator has the ability to suspend the application. EPA didn’t think about houses and cars, rather they were trying to protect workers. Action Items Fitz and POM will work together to rapidly get some answers. Description This was an add-on session at the request of the Antimicrobials Division. Discussion Antimicrobial Division’s Jennifer Mclain presented a powerpoint, primarily concerning a survey conducted by an industry group that goes by YOUGOV (although there is no government affliation), with the intention of determining if SFIREG would support the phrase “Safe for Use On” when used on cleaning product labels. SFIREG committee members did not have significant objections, although it was noted that the phrases ‘for use on’ or ‘compatible with x surfaces’ were not ambiguous. DfE back to POM. Develop a workgroup to determine how to take states out of the equation. Photo of Chester, Montana by Trudy Skari.